I've just finished watching Henry IV, Part 1. I was a little confused in the beginning because I haven't ever seen other movie adaptations of this play, so I wasn't sure of the plot. Apparently, there aren't many adaptations. I wonder if that's because there are two parts to it and would absolutely require a sequel. We continue on from Richard II following the story of his usurper, Henry Bolingbroke, now Henry IV and played by Jeremy Irons. The nobles who supported him against Richard are now threatening to rebel, including Northumberland and his great warrior son, Henry "Hotspur" Percy. 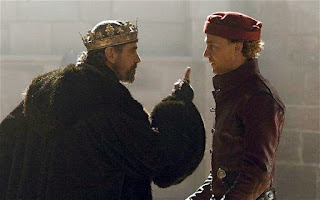 While the king wishes out loud that Hotspur was his son, his real son, Prince Hal, is busy hanging out in the tavern, pulling pranks and committing petty crime, with his best friend Falstaff. Eventually, the rebel forces and the king's forces (with Hal) meet at the Battle of Shrewsbury. There's a lot of theatrical screaming and very dramatic sword-fighting. The acting was superb. I didn't catch all the lines all the time, I have to say, but I caught the humor during the Falstaff scenes and as the movie went on, I understood more. My favorite scenes were the mock audience with the king, acted by Falstaff and Hal. My nephew has been on a Lion King kick, so Tom Hiddleston's Jeremy Irons impression as he pretends to be the king cracked me up. All I could think was "Uncle Scar." One-on-one combat with Hal and Hotspur was another favorite. And at the end, when Falstaff walks up with the dead Hotspur on his back, pretending to have killed him, and Hal just looks confused. Hal lets Falstaff take the credit for killing Hotspur. Next week comes Henry IV, part 2.